With winter season approaching, now is the time to do a few simple tasks around your home. Not only can this prevent damage from occurring, but it can help keep your home exterior clean. Instead of giving you a long laundry list of things to check off, we go over the five most important. This is simple question to ask yourself every spring and fall. Do you have one smoke detector on each floor of your home? Do I need to change the batteries? Do I own a fire extinguisher? If so, is it up to date? Where is my first aid/at home emergency kit? Do I need to make any changes? Can our family be okay if there is a major event like an earthquake, flood, tornado or other natural disaster? Am I Protecting My Home From Water Damage? Water damage can be a root cause of home problems. Sometimes they can be covered by your home insurance, but other times they are not. Regardless if they are covered, they are a terrible to deal with. Here are a few areas to check to lower your risk of water damage in your home. 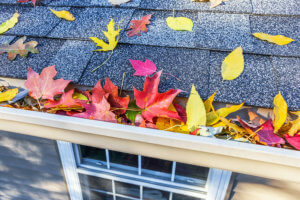 Once most of your leaves have fallen from your trees, simply look for debris that could be collecting in your gutters. If you see leaves collecting, remove them in order to prevent clogged gutters. If your gutters are clogged during a rainstorm, it could cause damage to your roof or siding. Also, check if your gutters are damaged & are still attached to your home. Lastly, check your downspouts. Ensure they are draining properly instead of being clogged and pooling water near your home. Loose or missing shingles on your roof can increase your risk for water damage. Make sure your shingles are in good condition before that winter storm hits. If you have a home with a flat roof, ensure it doesn’t have any buildup of leaves. When in doubt, refer out. If you aren’t sure what to look for, ask a professional. Are exposed pipes still insulated? Check the exposed pipes around your home to ensure the insulation isn’t ripped or torn. Uninsulated garages are very important to check. Many people assume it is “inside” but uninsulated garages can get as cold as the outdoor temperatures. Check there for pipes that need to be insulated. Is Air Escaping My Home? Check door and window seals for signs of deterioration. Use weather stripping or caulking around windows and doors to help keep warm air in and cold air out. You’ll also lower your energy bill. On another note, if air can get into your home, water can too. Did I Replace My Furnace Filter? To keep your furnace running efficiently, you need to replace the filter often. Some filters may need to be changed every month. Are Rodents Nesting In My Home? Rodents tend to nest in your crawlspace, attic and even in your walls. Walk the perimeter of your home & any access points in your garage to make sure you do not have any cracks or holes for rodents to enter. Also, check your vents along your foundation for holes or deterioration. As the weather gets colder, rodents are always looking for a warmer place to live. Also, remember rodents love a food source. If you are storing food or bird seed in your garage, make sure it’s properly stored in a sealed container. While preventative maintenance can get easily get pushed on the back burner when life gets busy, it’s still important to make the time to do it. If you have questions about your home or condo insurance, call Insurance Brokers of Arizona. Founded in 2005, Insurance Brokers of Arizona is a leader in quality protection for individuals, families and businesses throughout the Southwest. Insurance Brokers of Arizona is currently licensed in Arizona and California. Providing world class customer service with our extremely experienced and knowledgeable team, paired with our ability to understand our customer’s coverage needs, drives the success of our agency.